It’s only a year or so since it was pretty much a wild frontier in most states with regard to standards and regulations, and in some cases pretty much anyone could set themselves up as a testing lab with nothing more than a simple—and dangerously insufficient and inaccurate—test kit. But today, regulations are beginning to be mandated. Like the state of California has done with its various state agencies, other states that have legalized cannabis for medical use, adult consumption or both have also established government agencies or departments to oversee cannabis regulation or assigned those responsibilities to existing agencies. For instance, with the voters in Massachusetts having approved adult recreational use in November 2016, the state created a new agency called the Cannabis Control Commission”. Washington State charged its Liquor Control Board with developing a plan for regulating cannabis testing labs. There are also various validation consultants and companies who have begun to specialize in this industry. 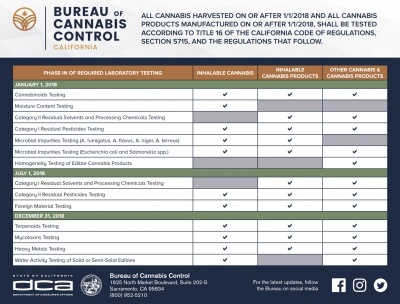 And of course the big news is that California finally updated and passed its temporary measures into law in January of 2019, with California Code of Regulations Title 16, Division 42, Bureau of Cannabis COntrol, with Chapter 6 the relevant section for laboratories. The vagaries of its initial regulations have been honed into specifics regarding required testing, even regarding methods, thresholds, limits and how the COA needs to look. However, despite strong state-specific efforts, regulations still vary from state to state and in Canada and Uruguay. In 2017 it was suggested that, to bring about more consistency, it may require the federal government “to set up policy guardrails to steer state regulatory systems” in a more unified and safe direction. Additionally, the unified efforts of standards organizations and professional associations may also help to bring even more consistency to testing. However, the advent of California’s detailed guidance, along with Canada’s (more relaxed and public health system-oriented) controls and those of other states, finds states or countries contemplating legalization in 2019 with a much better understanding and selection of paradigms on which to model their own regulations. In the case of Canada, the previous testing requirements and standards for medical cannabis were joined by a new set of pesticide testing requirements for recreational and medical cannabis in 2019. Much of what follows comes directly from Chapter 2 of Past, Present, and Future of Cannabis Laboratory Testing and Regulation in the United States on LIMSwiki. “a lack of accepted safety for use of the drug or other substance under medical supervision”. The CSA, in combination with the Reorganization Plan No. 2 of 1973 (which created the Drug Enforcement Administration (DEA)), meant the regulation and enforcement of the availability and use of controlled substances such as marijuana. However, decriminalization and legalization efforts of states over the past decades have brought federal regulation and enforcement conflicts to those states that have decriminalized and legalized marijuana, largely due to the federal government’s insistence on maintaining marijuana as a Schedule I drug. October 19, 2009: The Ogden Memorandum: A memorandum “intended solely as a guide to the exercise of investigative and prosecutorial discretion” in regards to state-based laws allowing medical cannabis. The guidance essentially told U.S. attorneys to not prosecute those entities complying fully with state cannabis laws. Researchers generally agree that this memo acted “as a catalyst for expansion of [state-sanctioned and gray market] cannabis supply in states with poorly defined regulations,” though the degree to which it influenced such growth remains poorly documented and requires further investigation. August 29, 2013: The Cole Memorandum 2: A follow-up memo to his original two years later, following 1. on the heels of then President Obama reiterating publicly that the Department of Justice (DoJ) was to not focus unnecessarily on states that had passed legalization laws and 2. Washington and Colorado legalizing recreational use of cannabis. The second memorandum sought to reduce the emphasis on the size of the grow-op and increase emphasis on—by a case-by-case basis—”whether the operation is demonstrably in compliance with a strong and effective state regulatory system.” The memo also clarified specific cases where federal enforcement would be warranted, including distribution to minors, interstate transport, and preventing drugged driving (though it didn’t state how). Generally speaking, states saw little federal intervention except in the case of state law being broken or requiring dispensaries to move further away from schools. December 16, 2014 to current: Joyce Amendment: A tenuous truce of sorts arrived with the passage of the Rohrabacher-Farr (today known as Rohrabacher-Blumenauer) Amendment in December 2014. It prohibited the DoJ from spending funds to prevent or enforce against state laws that allow for medical marijuana cultivation, distribution, and use, particularly when those actions are performed consistently with those state laws. One of the downsides of the amendment is that it has essentially acted as a short-term rider attached to several spending bills since December 2014, causing worry among many when it came up for renewal, particularly during the era of Trump and then U.S. Attorney General Jeff Sessions. Yet he Amendment continued to live on as the Rohrabacher-Blumenauer Amendment, with Rep. Earl Blumenauer taking over as co-lead with the retirement of Rep. Farr. Alternative bills had continued to be proposed in the meantime, including a more permanent version of Rohrabacher-Blumenauer introduced by Representative Dana Rohrabacher of California; however, Speaker Paul Ryan implemented rules prohibiting amendments to budgetary legislation, and the fact remained that Congress was still reluctant in hearing bills that would change the country’s marijuana laws. In early 2018, Rep. David Joyce submitted an amendment to protect against federal intrusions on medical marijuana patients abiding by state cannabis laws. Passing in May 2018 and acting the same as Rohrabacher-Blumenauer, the new Joyce Amendment is good through the 2019 fiscal year, meaning Rohrabacher-Blumenauer could expire without issue in December. August 11, 2016: DEA denies petition to reschedule marijuana out of Schedule I: A request made by two governors and a psychiatric nurse practitioner to the DEA asking it to reschedule marijuana into any other schedule other than Schedule I was denied, as had been done with previous attempts in 2009 and 2011. Reasons included known health issues such as prenatal exposure and negative impacts on several biological systems, as well as limited research data and new drug applications. At the same time, however, the DEA also recognized the need for further research and the lack of legal marijuana sources for researchers, publishing a policy statement stating intent “to increase the lawful supply of marijuana available to researchers.” However, that statement of intent has not been acted upon as of December 2018. December 2018: Congress set to vote and reconcile the 2018 Farm Bill: In April 2018, Majority Leader Mitch McConnell introduced the Hemp Farming Act of 2018, which later found its way into the 2018 Farm Bill. On November 29, lawmakers “struck a deal in principle” to finalize the 2018 Farm Bill, which, if passed, would remove industrial hemp from the Controlled Substance Act’s definition of “marijuana” as well as strike it from Schedule 1. As of early December, expectations are that Congress will reconcile and pass the bill with the industrial hemp text intact. As of December 2018, thirty-three U.S. states have put some sort of broad decriminalization or legalization laws for cannabis on the books. However, as previously noted, laws and regulations can very, sometimes significantly, among states. As shown by Cambron et al. in 2016 (before the November election results), dispensaries, possession limits, and interstate ID card acceptance can vary significantly among affected states. California, Colorado, Michigan, Oregon, and Washington lead in number of dispensaries; Massachusetts, Oregon, and Washington in maximum possession limits; and Arizona plus five others allowed ID cards from other states. Yet allowed dispensaries can number in the single digits, possession limits can be as low as one ounce, and numerous states still don’t honor ID cards from other states. As with most programs in the United States, every state takes a different approach. For example as of January 2016, New Jersey’s Public Health & Environmental Laboratories only test cannabis plant material. Just across the Hudson, however, New York’s Public Health Laboratory will not be testing any plant material, only cannabis extracts. In addition, the New York Department of Health will provide an oversight role for commercial cannabis laboratories that are licensed by the federal Drug Enforcement Administration (DEA) and approved for testing cannabis products. On the other hand, New Jersey state government does all testing in-house for the medical cannabis program. Cole et al. argue that in the end, it will take pressure on the federal government “to set up policy guardrails to steer state regulatory systems” in a more unified and safe direction. Drugged driving, use by minors, interstate distribution, relation to crime and firearms, consumer safety, and advertising are all issues the government should be tackling towards that goal, they say. Not that states aren’t addressing these regulatory concerns; they are, but not in consistent ways. While federal, state, and local governments wrestle with the regulatory frameworks surrounding cannabis, scientists and government officials are carrying on, doing what they can to harmonize those regulations with emerging industry standards and guidelines. Standards for cannabis testing are admittedly still in flux but growing in number. In any case, some standards apply to cannabis labs as they do to any labs, especially if they want to be competitive; baseline certifications and standards include GLP/GALP and ISO 17025/9001:2015. Additionally, while some disconnects between federal and state laws do exist, QA/QC are still subject to 21 CFR Parts 210 and 211 part 11, and, in New York for example, the DEA. Beyond those base laboratory standards, organizations such as Americans for Safe Access Foundation (ASAF), American Herbal Pharmacopoeia (AHP), American Herbal Products Association (AHPA), Association of Official Agricultural Chemists (AOAC), and the American Oil Chemists’ Society (AOCS) have been developing standards, methods, and certifications for analysis, extraction, labeling, and laboratory operations surrounding medical (and recreational) marijuana. Notable among those organizations is the Foundation of Cannabis Unified Standards (FOCUS), which worked to produce internationally applicable voluntary consensus standards for various parts of the cannabis business chain, including cultivation, extraction, laboratory testing, and packaging. FOCUS completed its public review process and finalized its standards in July 2016, though at that time it wasn’t clear how to gain access to them. New information came to light in March 2017, when FOCUS and ASTM International announced a collaboration between the two entities, which in April 2017 saw the formation of volunteer committee D37 at ASTM and the further adaptation of FOCUS’ standards to future ASTM releases. Regardless, there remains at present a certain degree of inconsistency in test results from different labs, due for the most part to limited supply of good quality reference standards for QC and varying SOPs/methods. However, the trend is very much in the direction of required lab certifications to the same methods. The issue is compounded in that different methods of use (smoking, vaping, edibles, capsules, sublingual, topical, drinks) yield different delivered time-release and cumulative potencies, making recommended dosages somewhat problematic. However, the increased uniformity of laws and standards is leading to a general acknowledgment that the quality and consistency in the cannabis testing industry is quickly improving. Beyond that, accessing the specific government websites will lead to the applicable regulatory information in most cases. ↑ “California Cannabis Portal”. State of California. 2018. https://cannabis.ca.gov/. ↑ CannaRegs and New Frontier (2017). “State-By-State Marijuana Policies”. National Cannabis Industry Association (NCIA). http://thecannabisindustry.org/state-marijuana-policies-map. Retrieved 23 January 2017. ↑ Anderson, W.H. (26 August 2013). “Cannabis Testing Labs: Standards and Accreditation”. Washington State Liquor Control Board. https://lcb.wa.gov/publications/Marijuana/BOTEC%20reports/2b_Accrediting_Labs_Final_10_15_13.pdf. ↑ State of California (January 2019). “California Code of Regulations Title 16. Professional and Vocational Regulations Division 42. Bureau of Cannabis Control”. Thomson Reuters Westlaw. https://govt.westlaw.com/calregs/Browse/Home/California/CaliforniaCodeofRegulations?guid=I57220DEBD2E54B1BB1EC67A6467E2F2E&originationContext=documenttoc&transitionType=Default&contextData=(sc.Default). Retrieved 6 February 2019. ↑ 5.0 5.1 Cole, T.; Trumble, S.; Hatalsky, L.E. (17 February 2016). “All State Marijuana Laws Are Not Created Equal”. Third Way. http://www.thirdway.org/report/all-state-marijuana-laws-are-not-created-equal. Retrieved 02 February 2017. ↑ Beggan, P. (11 December 2018). “Canada Unveils New Cannabis Testing Standards For 2019”. Ganjapreneur. https://www.ganjapreneur.com/canada-unveils-new-cannabis-testing-standards-for-2019. Retrieved 06 February 2019. ↑ 7.0 7.1 7.2 “§812. Schedules of controlled substances”. United States Code. U.S. Government Publishing Office. 03 January 2012. https://www.gpo.gov/fdsys/pkg/USCODE-2011-title21/html/USCODE-2011-title21-chap13-subchapI-partB-sec812.htm. Retrieved 27 January 2017. ↑ 8.0 8.1 Leger, D.L. (11 August 2016). “Marijuana to remain illegal under federal law, DEA says”. USA. Today. Gannett Company. http://www.usatoday.com/story/news/2016/08/11/dea-marijuana-remains-illegal-under-federal-law/88550804/. Retrieved 20 January 2017. ↑ 9.0 9.1 Joseph, A. (10 August 2016). “DEA decision keeps major restrictions in place on marijuana research”. STAT. Boston Globe Media. https://www.statnews.com/2016/08/10/marijuana-medical-research-dea/. Retrieved 25 January 2017. ↑ 10.0 10.1 Grubbs, A. (13 August 2016). “DEA Declines Request to Reclassify Marijuana, Citiing Its ‘High Potential for Abuse'”. CNSNews. Media Research Center. http://www.cnsnews.com/news/article/alex-grubbs/dea-declines-request-reclassify-marijuana-citiing-its-high-potential-abuse. Retrieved 27 January 2017. ↑ “Reorganization Plan No. 2 of 1973”. United States Code. U.S. Government Publishing Office. 03 January 2012. https://www.gpo.gov/fdsys/pkg/USCODE-2011-title5/html/USCODE-2011-title5-app-reorganiz-other-dup96.htm. Retrieved 27 January 2017. ↑ “Drug Enforcement Administration: 1970–1975” (PDF). DEA History In Depth. U.S. Drug Enforcement Administration. https://www.dea.gov/about/history/1970-1975.pdf. Retrieved 27 January 2017. ↑ 13.0 13.1 Romza-Kutz, D.; Roth V., F. (15 August 2016). “The silver lining in the DEA’s refusal to reclassify cannabis”. Tracking Cannabis. Thompson Coburn LLP. http://www.thompsoncoburn.com/insights/blogs/tracking-cannabis/post/2016-08-15/the-silver-lining-in-the-dea-s-refusal-to-reclassify-cannabis. Retrieved 25 January 2017. ↑ Hudak, J. (20 June 2015). “The Conflict Between Federal and State Marijuana Laws Claims a Victim”. Newsweek. Newsweek, LLC. http://www.newsweek.com/conflict-between-federal-and-state-marijuana-laws-claims-victim-345099. Retrieved 27 January 2017. ↑ Drug Policy Alliance; MAPS (June 2014). “The DEA: Four Decades of Impeding And Rejecting Science” (PDF). Drug Policy Alliance. http://www.drugpolicy.org/sites/default/files/DPA-MAPS_DEA_Science_Final.pdf. Retrieved 27 January 2017. ↑ Ogden, D.W. (19 October 2009). “Memorandum for Selected United State Attorneys on Investigations and Prosecutions in States Authorizing the Medical Use of Marijuana”. Justice Blogs. Department of Justice. https://www.justice.gov/opa/blog/memorandum-selected-united-state-attorneys-investigations-and-prosecutions-states. Retrieved 26 January 2017. ↑ 17.0 17.1 17.2 17.3 17.4 17.5 Cambron, C.; Guttmannova, K.; Fleming, C.B. (2017). ”State and National Contexts in Evaluating Cannabis Laws: A Case Study of Washington State”. Journal of Drug Issues 47 (1): 74–90. doi:10.1177/0022042616678607. ↑ Cole, J.M. (29 June 2011). “Memorandum for United States Attorneys” (PDF). Department of Justice. https://www.justice.gov/sites/default/files/oip/legacy/2014/07/23/dag-guidance-2011-for-medical-marijuana-use.pdf. Retrieved 26 January 2017. ↑ Greenfield, S.H. (30 August 2013). “The Cole Memo 2.0: This Changes Everything”. Simple Justice. https://blog.simplejustice.us/2013/08/30/the-cole-memo-2-0-this-changes-everything/. Retrieved 26 January 2017. ↑ Cole, J.M. (29 August 2013). “Memorandum for All United States Attorneys” (PDF). Department of Justice. https://www.justice.gov/iso/opa/resources/3052013829132756857467.pdf. Retrieved 26 January 2017. ↑ “Federal Marijuana Enforcement Policy”. Marijuana Policy Project. 2016. https://www.mpp.org/federal/federal-enforcement-policy-on-state-marijuana-laws/. Retrieved 26 January 2017. ↑ Armentano, P. (16 December 2014). “President Signs Federal Spending Bill Protecting State Sanctioned Medical Marijuana Programs”. NORML Blog. NORML Foundation. http://blog.norml.org/2014/12/16/president-to-sign-federal-spending-bill-protecting-state-sanctioned-medical-marijuana-programs/. Retrieved 27 January 2017. ↑ Swerdlow, L. (22 January 2017). “April 28, 2017 – Be Afraid, Be Very Afraid + IRS FU”. Marijuana Anti-Prohibition Project. http://www.marijuananews.org/afraid. Retrieved 27 January 2017. ↑ Yakowicz, W. (20 January 2017). “The Perfect Storm That Could Cripple the Marijuana Industry Under Trump”. Inc. Mansueto Ventures, LLC. http://www.inc.com/will-yakowicz/perfect-storm-regulations-could-cripple-marijuana-industry.html. Retrieved 27 January 2017. ↑ Rohrabacher, D. (11 January 2017). “Rohrabacher praises Sessions, urges AG nominee to respect federal marijuana law”. State of California. https://rohrabacher.house.gov/media-center/press-releases/rohrabacher-praises-sessions-urges-ag-nominee-to-respect-federal. Retrieved 27 January 2017. ↑ Mui, Y. (14 March 2017). “Trump and his attorney general are freaking out the $7 billion pot industry”. CNBC. CNBC, LLC. http://www.cnbc.com/2017/03/14/donald-trump-and-jeff-sessions-anti-legal-pot-industry.html. Retrieved 15 March 2017. ↑ Adams, M. (13 March 2017). “Marijuana Bills Currently In Congress: How They Can Change The Game”. The Fresh Toast. 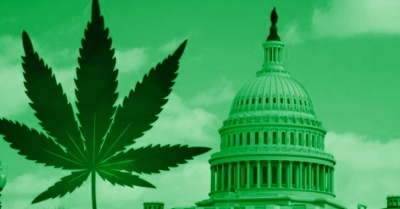 Project Coco, Inc. https://thefreshtoast.com/cannabis/marijuana-bills-currently-congress-can-change-game/. Retrieved 15 March 2017. ↑ Ruskin, Z. (08 March 2017). “Sessions Hints at a War on Marijuana. Now What?”. SF Weekly. San Francisco Media Co. http://www.sfweekly.com/news/chemtales/sessions-hints-at-a-war-on-marijuana-now-what/. Retrieved 15 March 2017. ↑ Misulonas, J. (18 May 2018). “Congressional Committee Passes Amendment Protecting Medical Marijuana Laws from Jeff Sessions”. Civilized. https://www.civilized.life/articles/congressional-commitee-passes-medical-marijuana-amendment/. Retrieved 11 December 2018. ↑ “Applications To Become Registered Under the Controlled Substances Act To Manufacture Marijuana To Supply Researchers in the United States”. Federal Register 81 (156): 53846–8. 12 August 2016. https://www.federalregister.gov/documents/2016/08/12/2016-17955/applications-to-become-registered-under-the-controlled-substances-act-to-manufacture-marijuana-to. Retrieved 27 January 2017. ↑ Gurman, S. (08 September 2018). “Marijuana-Research Applications Go Nowhere at Justice Department”. The Wall Street Journal. Dow Jones & Company, Inc. https://www.wsj.com/articles/marijuana-research-applications-go-nowhere-at-justice-department-1536404401. Retrieved 13 November 2018. ↑ Ordoñez, F.; Kumar, A. (07 November 2018). “Trump fired Sessions. Here are four takeaways from the attorney general’s tenure”. Miami Herald. The McClatchy Company. https://www.miamiherald.com/news/nation-world/national/article221305965.html. Retrieved 13 November 2018. ↑ Pamuk, H. (29 November 2018). “U.S. lawmakers seal Farm Bill agreement in principle”. Reuters. https://www.reuters.com/article/us-usa-farmbill/u-s-lawmakers-seal-farm-bill-agreement-in-principle-idUSKCN1NY21M. Retrieved 06 December 2018. ↑ Milligan, S. (04 December 2018). “Legalization of Hemp Could Be First Step for Federal Marijuana Protections”. U.S. News and World Report. https://www.usnews.com/news/national-news/articles/2018-12-04/legalization-of-hemp-could-be-first-step-for-federal-marijuana-protections. Retrieved 06 December 2018. ↑ Stewart, I.A. ; Kloss, J.M. ; Willner, N.M. (04 December 2018). “Will Hemp-Derived CBD Be Fully Legal with Passage of the 2018 Farm Bill? Not Quite…”. The National Law Review. https://www.natlawreview.com/article/will-hemp-derived-cbd-be-fully-legal-passage-2018-farm-bill-not-quite. Retrieved 06 December 2018. ↑ Berke, J.; Gould, S. (07 November 2018). “Michigan is the 10th state to legalize recreational marijuana. This map shows every US state where pot is legal”. Business Insider. Insider, Inc. https://www.businessinsider.com/legal-marijuana-states-2018-1. Retrieved 13 November 2018. ↑ 37.0 37.1 Association of Public Health Laboratories (May 2016). “Guidance for State Medical Cannabis Testing Programs” (PDF). pp. 35. https://www.aphl.org/aboutAPHL/publications/Documents/EH-Guide-State-Med-Cannabis-052016.pdf. Retrieved 01 February 2017. ↑ Saman, A. (22 May 2016). “18 GMP Cannabis defintions you need to know”. HempHacker.com. http://hemphacker.com/cgmp-definitions-for-the-cannabis-industry-21-cfr-part-210/. 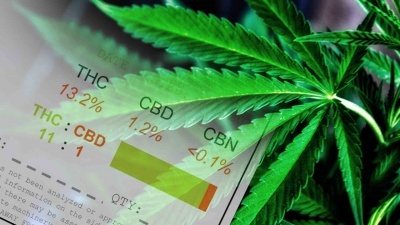 ↑ “New Certification Program Brings Quality Assurance to the Medical Marijuana Industry”. Information Forecast, Inc. 2016. http://infocastinc.com/industries/new-certification-program-brings-quality-assurance-to-the-medical-marijuana-industry/. Retrieved 02 February 2017. ↑ Cannabis Committee, AHPA (02 February 2016). “Recommendations for Regulators – Cannabis Operations” (PDF). American Herbal Products Association. http://www.ahpa.org/Portals/0/pdfs/AHPA_Recommendations_for_Regulators_Cannabis_Operations.pdf. ↑ Upton, R.; Craker, L.; ElSohly, M. et al., ed. (2014). Cannabis Inflorescence: Cannabis spp.. American Herbal Pharmacopoeia. ISBN 1929425333. http://www.herbal-ahp.org/order_online.htm. ↑ Project CBD; Marcu, J. (16 March 2016). “Jahan Marcu: Cannabis Lab Testing & Safety Protocols”. Project CBD. Project CBD. https://www.projectcbd.org/article/jahan-marcu-cannabis-lab-testing-safety-protocols. Retrieved 03 February 2017. ↑ Erickson, B.E. (13 November 2017). “Cleaning up cannabis”. Chemical & Engineering News. American Chemical Society. https://cen.acs.org/articles/95/i45/Cleaning-cannabis.html. Retrieved 15 November 2018. ↑ Cassiday, L. (October 2016). “The Highs and Lows of Cannabis Testing”. INFORM. American Oil Chemists’ Society. https://www.aocs.org/stay-informed/read-inform/featured-articles/the-highs-and-lows-of-cannabis-testing-october-2016. Retrieved 03 February 2017. ↑ “Public Review Completes Development Process”. FOCUS. 2016. http://www.focusstandards.org/public-review-of-cannabis-standards/. Retrieved 16 February 2016. ↑ Biros, A.G. (02 March 2017). “ASTM International Launches Cannabis Committee”. Cannabis Industry Journal. Innovative Publishing Co. LLC. https://www.cannabisindustryjournal.com/news_article/astm-international-launches-cannabis-committee/. Retrieved 10 March 2017. ↑ “Committee D37 on Cannabis (Pending approval from the ASTM Board of Directors, April 26, 2017)”. ASTM International. 01 March 2017. https://www.astm.org/COMMITTEE/D37.htm. ↑ Maxwell, J. (May 2017). “The Need for Cannabis Standards”. ASTM Standardization News. ASTM International. https://www.astm.org/standardization-news/?q=features/need-cannabis-standards-mj17.html. Retrieved 14 November 2018. ↑ “Committee D37 on Cannabis”. ASTM International. 2018. https://www.astm.org/COMMITTEE/D37.htm. Retrieved 14 November 2018. ↑ May, M. (21 February 2018). “ASTM D37 Cannabis Committee Looks to Expand its Reach in 2018”. Analytical Cannabis. Technology Networks. https://www.analyticalcannabis.com/articles/astm-d37-cannabis-committee-looks-to-expand-its-reach-in-2018-297750. Retrieved 14 November 2018. ↑ “ASTM International Cannabis Committee Approves First Two Standards”. ASTM International. 18 May 2018. https://www.astm.org/cms/drupal-7.51/newsroom/astm-international-cannabis-committee-approves-first-two-standards. Retrieved 14 November 2018. ↑ ASTM International (23 August 2018). “ASTM Announces New International Standard Projects to Help Reduce Hazards in Cannabis Processing and Cannabis Sampling Procedures”. Cannabis Business Executive. https://www.cannabisbusinessexecutive.com/2018/08/astm-international-standard-underway-help-reduce-hazards-cannabis-processing/. Retrieved 14 November 2018. ↑ Dorm, D.. “Certification Becoming Standard For Cannabis Testing Facilities”. Medical Jane. https://www.medicaljane.com/2013/11/04/certification-becoming-the-standard-for-cannabis-testing-facilities. Retrieved 23 January 2017. ↑ Despres, H.. “Cannabis testing: a review of the current landscape”. AOCS. https://www.aocs.org/stay-informed/read-inform/featured-articles/cannabis-testing-a-review-of-the-current-landscape-may-2014. Retrieved 23 January 2017.